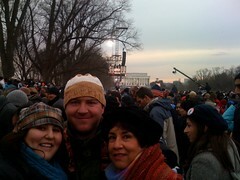 I can’t believe that I was there to see Barack Obama get sworn in as President of the United States. It was an amazing experience. I didn’t really see anything. I could see the Capital. Everything I saw, I saw on a jumbotron. The only thing that mattered was being a part of a million plus people who really just wanted something to be excited about. And they were excited. We were excited. We were also cold and tired but that didn’t matter. We were there. The day started at 4:20am. We got up, got dressed, grabbed our food and got out the door. We left at 5am, got to the metro station 15 minutes later, had a little panic attack when we couldn’t turn left into the metro station but we went around the back and while there were a lot of cars and people, there was plenty of parking. The metro station was crowded but people moved through quickly and we got on a train with no problems. Our only hitch for the day was that we couldn’t cross Pennsylvania Avenue (the parade route) which we had read we could, so after walking a bit, we doubled back and got back on a train to backtrack two stops. We met some very nice people from Southern California who were having the same problem and we told them our plan and they asked if they could follow us which of course was no problem. The good news is that our plan worked and we were able to get to the mall except that we were about 10 blocks farther away from the Capitol than we had planned. We were going to keep walking and get as close as we could but after two blocks we were in front of the Washington Monument and up on a little hill and had a great view of the Capitol and a jumbotron screen. We decided to stay put in part because we figured being closer to the metro was better and because the mall was already looking really crowded. At 8am we had plenty of space for our blanket so that we could lay down and relax. By 10am, it was standing room only. Here’s the important part. Using a potty was no problem. All the news reports kept saying there’s one bathroom for every 400 people. And maybe so, but when I needed to go, I was able to use a relatively clean porta-pottie without having to wait. They had TP and antibacterial gel so I was happy. The ceremony was awesome. It is amazing how quiet one million people can be. And they were also quite loud, but at appropriate parts. If you saw it on tv, you know how great it was. Probably the only difference between your experience and my experience is that you could feel your toes and I couldn’t. I really enjoyed President Obama’s inaugural address. He was able to balance the realism of the difficult times and the long road ahead with a feeling of hope and the potential for the future. He has a way of inspiring people and I hope that people, myself included, really will heed his call to action. President Obama has a way of uniting people to work towards a common purpose which is something really needed in our country and I left the ceremony feeling optimistic about the future. I will admit that walking back to the metro station, I started to think that being there wasn’t worth all the trouble. But I think that was my low blood sugar talking. It took us nearly two hours to walk about a mile and a half. Then we were held up outside the metro station while they got people onto trains and cleared the masses off the platform. That was only about fifteen minutes and we got through the station gates quickly and a train pulled us as we were on the down escalator and we got on that train which thank goodness had seats available. Once I was sitting, I was again grateful to have been there. I can’t believe we were there. Yesterday was the We Are One concert in Washington, DC. We were there and it was awesome! I didn’t really know what to expect except for lots of people. We left at 9:30 (for a 2:30 concert) and didn’t have any problems finding a parking space or getting on a train. It seemed like they were running trains on a rush hour schedule which was very smart. We had a short walk from the metro station to the reflecting pool. We found clean port-o-potties, Starbucks, and Obama gear on the course of our walk. Getting through security was no problem; they were very efficient and polite but it helped that we checked out the restricted items list. 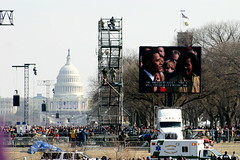 We ended up with great “seats” about halfway up the reflecting pool, in front of a jumbo screen. We could see Mr. Lincoln, sitting so solemnly in his memorial. The entertainment was amazing. Bill pointed out that he really enjoyed hearing artists cover other songs because it can show what great singers they really are and he was right. There were lots of actors participating too, reading inspirational, historical “stuff”. We were also really surprised that Obama and Biden stayed for the entire concert. They would occasionally show him rockin’ out, singing along to music, and when he came on the screen everyone cheered. The feeling in the air was one of joy and hope. I think that Mary J. Blige was my favorite, having sung Lean on Me. U2 was also awesome, with Bono saying that it was a big deal for a kid from the west side of Dublin. All the (male) actors and many of the performers wore suits which to me was a reflection of the respect they felt for the moment. And the concert ended as I thought it should, with everyone on stage together. It took us 75 minutes to get on a train which was not bad at all. About an hour was walking to the metro station and 15 minutes waiting once we got to the station. Not bad at all. Today Mom, Bill and I participated in a National Day of Service by donating blood. The donation center was hopping and it took us about an hour and a half from start to finish. We’ve got a little bit to do before tomorrow. Sandwiches to make. Boots to find. Cameras to charge. I’m not looking forward to waking up at o’dark hundred, but it will be worth it! I have been in a state of constant excitement for the last couple of days. Yesterday, it was because Bill was flying in from California. Today, it is because my mom is driving in. I am like a little kid when it comes to expecting guests. I have gotten so little done because I can’t concentrate – the anticipation!! Aside from the fact that it will be nice to be with my family, there is a lot going on this weekend in the metro Washington DC area. This guy, Barack Obama, is being inaugurated this weekend. Maybe you’ve heard? I am so excited. Bill and I went to the inauguration eight years ago. We were relatively new to the area and figured it would be an experience. It was very cool. I want to say that we went without a lot of planning, and I don’t know why but we brought a transitor radio with us. Best thing we could have done. We were far from the Capitol and couldn’t hear a thing, but we were able to get Bush’s speech on the radio. There we were, holding the radio, surrounded by complete strangers who huddled around us to hear. It was cool. We also got lucky because the motorcade passed right in front of us on the way from the White House to the Capitol and we saw the President and President-elect on the way to the ceremony. Okay, saw is a strong word, but they were in those cars. And if this all isn’t enough, my birthday is on Wednesday! And my mom and Bill will be here to celebrate!! I have not spent my birthday with my mom in a really, really, really long time. I wonder if she will bake me a cake? So if you are wondering what this post has to do with the picture, the answer is nothing. But I feel compelled to always post a photograph. 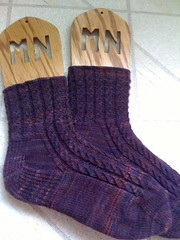 Actually, these are socks that I finished while I was visiting my west coast home. They are Jonesy’s Toe Up Socks from Mountain Colors. The yarn is Mountain Colors Bearfoot. They took me about 14 months from start to finish (I spent a lot of that time NOT knitting them). And they are photographed on sock blockers that Bill bought me for Christmas! I really enjoyed the pattern – a faux cable as I like to call it. I was concerned about how much yarn I had so they are a little longer than anklets. As it turned out, I had just enough yarn. I also have decided that I really like toe-up socks because if one sock equals one skein you can just keep knitting until you run out of yarn. These were one skein = two socks hence my concern about yarn. But I don’t like the toe as much as the toe from the top down socks I am currently working on. Everything is a tradeoff. But this is the first pair of toe up socks I’ve done. There are others and maybe I will like those toes more. And in the interest of full disclosure, the top down socks I am working on are the first of that kind too. I am new to socks, but completely hooked! If I was looking for a way to tie everything together I could say that these were socks I plan on wearing to the inauguration on Tuesday, but that’s not the case. They took me so long to do I am scared to wear them. Welcome to my spot on the web where I talk about needlework, crafts, and [many] other random things. A few tidbits about me: I met my husband in college, flirting over tuba letters in the Penn Band. Our dog, CJ, and our cat, Sabrina, round out our family. I'm a sewist, knitter and needlepointer, and an occasional scrapbooker. I love organizing, reading, making jewelry, and hiking. A Chicago girl at heart, I am an avid follower the Cubs, Bears, and Blackhawks. You can email me at mlynapier [at] pobox [dot] com. Thank you for stopping by! A place for me to sell my handmade goods. My style? It's fun and funky with a hint of romance. Much thanks to my husband Bill for his work on this site!